Rajasthan CM Ashok Gehlot and veteran Congress & Jat leader Parasram Maderna were seen together on a public platform nearly after 12 years. In fact, it was Maderna's daughter-in-law, Leela, who had invited Gehlot as chief guest for loan and dividend distribution programme of Rajasthan State Co-operative Bank (Apex Bank). She is the chairperson of the bank. Her husband and cabinet minister in the Gehlot government Mahipal Maderna was also present in the programme. 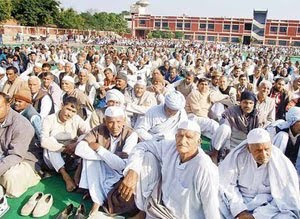 Significantly enough, both Gehlot and Maderna senior who have had an uneasy relationship for more than a decade when the former was made the chief minister overlooking the latter's claim after 1998 Assembly elections, also praised each other during the function in Maderna's native village Chadi on Sunday. 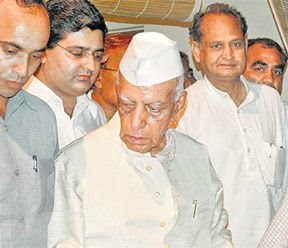 Remembering Maderna's role in his political rise, Gehlot said, "I cannot forget Madernaji's role when I became first Union minister from Jodhpur in Indira Gandhi's government." He also reminisced about the night halt with Maderna in Chadi village 31 years ago. "Madernaji campaigned for me when I contested my first election," Gehlot said. He also said that the young leaders should use experience of old generation. Accepting olive branch offered by the CM, Maderna who belongs to the generation of stalwart Jat leaders like Nathuram Mirdha, Daulatram Saran and Kumbha Ram Arya showered praise on Gehlot. He praised Gehlot's work as the chief minister. However, the newfound bonhomie between the two estranged leaders is a signal of changing equation in the internal politics of in the ruling congress that would create ripples in the party. It may also affect long pending decision on the new PCC chief. Hemant Lamba is the recipient of the ‘Green Oskar’ award for his work on distribution of reliable and cheap solar devices in 12 Indian states. Lamba and his teammates successfully delivered affordable, reliable and renewable energy products (in the form of solar panels), benefiting about 80,000 people. The Ashden Trust of the Sainsbury’s trusts in Britain set up the awards in 2001. Each award comes with $50,000 towards improving the project. Lamba and his team have brought government, banks, non-governmental organisations and manufacturers together to deliver products that are relatively effective and affordable. 250 local people have been trained in maintaining the power supply through renewable energy resources. Lamba is now working to make these projects more popular. Lamba's goal is to attract private enterprises to set up new networks and franchises to link all these elements. Rina Dhaka also known as 'Goddess of Oomph' of Indian fashion, designer Rina Dhaka styles clothes with a lot of fun. Being in the industry for quite some time, Rina feels that globalization has opened up avenues for young and dynamic women and with it, the options of women designers as well. To be in sync with demand for comfortable, yet stylish outfits for offices, designers are trying out all possibilities of being creative. Rina Dhaka emphasizes silhouette and is willing to take risks. In one collection, she mixed fur and boots with her Indian outfits, to create a unique look. Every time, Dhaka tries to give four to five looks to in her collection. Early Life: Rina Dhaka has been a dreamer ever since her childhood. For her, visuals are always more important than words. After completing her graduation, she did a training project with Intercraft and also trained under Evan Grandhal. She had opened up a salwar kameez boutique for one of her friend. It was also around this time that Mutiny and Ensemble were coming up as fashion houses. Rina stated designing for these fashion houses and her designs were well received by the people and thus, it confirmed her entry into fashion forum. Career and Success: It was very early in her career when Rina got accolades for one of her design for the Miss India event from Rohit Khosla, the only ingenious designer of that time. The encouragement acted as a booster for Rina, who was all the more excited to bring out the best in her. Her first show in Singapore "The Best of Indian Haute Couture" met with a thumping success. Rina has also won a Yuva Rattan award in career, which is spread over almost three decades now. Brand and Clientele: Rina Dhaka has her collections, under the label 'Rina Dhaka', in stores like Carma-Delhi, Design Studio-Mumbai, Kimaya-Mumbai, Selfridges-London, Coin-Italy and Lord and Taylor-New York. She has also opened a studio in Hauz Khaz village for Lycra in Delhi. The clientele list of this bold designer includes eminent personalities such as Naomi Campbell, Uma Thruman, Susan Fales Hill, Molly Simns, Tara Palmen Tomkison, Lara Dutta, and Diana Hayden. Her work has been featured in publications such as Marie Claire Paris, Madame Figaro Paris, Vogue London, New York Post, Vanity Fair, etc. Indian boxing ace Vijender Singh married Delhi girl Archana Singh in a low-key ceremony in Delhi on Tuesday. The marriage, solemnised at the Delhi Flying Club, was attended by family and friends of the 25-year-old boxer, India's first Olympic and World Championships medallist. He claimed bronze medals in both these meets. The couple will host a reception at Vijender's native village Kaluwas in Bhiwani on Wednesday. Congress leader Rahul Gandhi, BJP MP Shahnawaz Hussain, former Union Minister Captain Satish Sharma, Indian Boxing Federation chief Abhay Singh Chautala and national boxing coach G S Sandhu were among the prominent guests at the wedding ceremony, which lasted a couple of hours, after which the couple and their families drove off to Bhiwani. Gandhi, a friend of the boxer and an avid boxing fan himself, stayed at the venue for about ten minutes and wished the newly-wed couple. Vijender wore a cream sherwani for the occasion while his software engineer bride was dressed in a red sari, designed by Tarun Tahiliani . Archana hails from Muzaffarnagar, Uttar Pradesh, and works with the British High Commission in Delhi. "A new chapter of my life starts today and I hope it would be as successful as my boxing career. But I have very little time for prolonged celebrations as I would be heading to Cuba for a training tour later this month. The Asian Championships are also coming up next month, so it's back to training pretty soon for me," Vijender said after tying the knot. 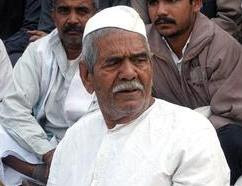 Jat leader and Bharatiya Kisan Union (BKU) president Mahendra Singh Tikait, who headed several farmer agitations, died here this morning after prolonged illness. He was 76. Bhartiya Kisan Union (BKU) Mahendra Singh Tikait breathed last on Sunday morning at the residence of his elder son in Muzaffarnagar, UP. Tikait was suffering from cancer and liver problem since quite a long time and succumbed to his illness at his son Rakesh Tikait's residence at around 7am. He was 76 and is survived by four sons and two daughters. His mortal remains would be kept in Muzaffarnagar till 4pm and thereafter would be shifted to his native village Sisauli, headquarters of BKU, where it will be kept at Kisan Bhawan for public to pay their last respects. His last rites would be carried out at his village on Monday afternoon. 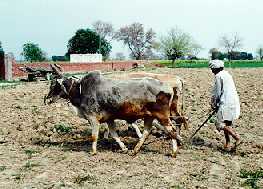 Mahendra Singh Tikait emerged as a popular farmer leader after Choudhary Charan Singh and he raised many issues of farmers. At times, union and state government bent before this leader who kept the BKU united even at the time of crisis. There is a new Jat in town. And he is sick of being a son of the soil and doing the nation’s heavy lifting. In the late 1990s, when kitsch was still cool and Channel V was the best friend everyone had been waiting for, Udham Singh arrived on his haunches. Props: a buffalo, a lathi and a dangerous, deadpan sense of humour. Udham was a Borat before his time, both playing out the stereotypes of a Haryanvi Jat and puncturing the hot air balloons of English speaking urbanites. Manish Makhija, the radio jockey and music composer who played and scripted Udham Singhn, lives in Mumbai. The show might be long gone but his Jatphilia still thrives. Occasionaly he chats up young Jats in Mumbai nightclubs where, far from home, they're thrilled at the chance to to slip back into the lingo and rough hewn accents that their parents paid so much to erase out of them. Full article is mentioned below.